Is Russia's Robotic Space Program Headed for a Renaissance? Earlier this year, Russia's Phobos-Grunt to Mars never left Earth orbit. Russian space officials are rekindling their plans for moon exploration, and some say a rebirth of that country's robotic space endeavors beyond low-Earth orbit is on the horizon. Work is already underway on the Luna-Glob and Luna-Resource missions, to be launched in the coming years. These orbiters and landers are preludes to future spacecraft that would haul lunar samples back to Earth, ostensibly setting the stage for even grander plans, such as a Russian moon base. Also on the Russian space books is an aggressive Venus mission, as well as an attempt at the first Mercury landing. Grand plans these, but are they on solid footing given Russia's ruinous track record over many years in pushing payloads to other worlds? For example, a mix of technological snafus and poor management botched the Phobos-Grunt Mars mission earlier this year, and the failed probe to fell back to Earth without reaching the Red Planet. Indeed, the Russians "have been engaged for some time in a renaissance of their extremely successful Luna program," said James Head, a noted space scientist within the Department of Geological Sciences at Brown University. Head observed the program's past track record, in which the former Soviet Union successfully completed three robotic sample-return missions at the moon (Luna 16, 20, and 24), also succeeding with two very well-instrumented robotic lunar rovers — Lunokhod 1 (Luna 17) and Lunokhod 2 (Luna 21) — and several orbiters, all undertaken more than 35 years ago. "These basic accomplishments represent an amazing robotic capability not duplicated by anyone, including the United States," Head told SPACE.com. The Russians are building on the original clever and novel engineering designs for these missions and thinking ahead, with a focus on polar landers and a search for volatiles in the polar and near-polar regions, Head said. "Sample-return missions are very likely to focus on the discoveries of the early polar Luna lander and rover missions," Head continued, "and involve the return of volatile-containing samples using special devices for preservation and return." Plans are underway to relink Russia with the moon. Shown here is Luna-Glob. At Brown University, Head and his team have collaborated for years with their Russian colleagues from the Institute for Space Research and the Vernadsky Institute. Working together, these teams have scoped out candidate landing sites for lunar spacecraft, and also possible destinations for future Lunokhod rovers and sample-return missions to the moon. "The Russian lunar strategy is clearly working toward a set of larger Russian national goals," Head said. For example, Russian Deputy Prime Minister Dmitry Rogozin recently stated that Russia should build a large lunar base for scientific advancement and that this "super goal" could be used to achieve "leaps" in science and to give a new sense of purpose to Russia's space program. Rogozin has stated that the moon base, which would include cosmonauts, should be a jumping-off point for future deep-space projects, Head said. "While the United States seems to be abandoning human and robotic lunar surface exploration for the near future, the Russians clearly see it as a major international and national leadership opportunity and technology driver," Head concluded. "And [they] are proceeding vigorously." Last October, Wesley Huntress, Jr., director emeritus of the Geophysical Laboratory of the Carnegie Institution of Washington teamed up with Mikhail Marov, a professor and academician of the Russian Academy of Sciences, to detail the history and future of Russia's robotic lunar and planetary exploration program. Speaking at a symposium on the 50th anniversary of planetary exploration in Arlington, Va., Huntress underscored the "tragic loss of vision, enterprise and expertise" of the former Soviet Union's (now Russia's) robotic planetary effort. They had become handicapped by poor electronics technology, poor system engineering management, insufficient ground systems testing, and a complex, entangled, heavy-handed national system of control and supply, Huntress noted. According to Marov, the disintegration of the former Soviet Union, followed by social-economical turmoil dramatically affected the Russian space program, specifically solar system exploration. Marov emphasized in his talk that Russia's space budget has shrunk many times, with the lion's share of its funding going for orbital station operations and support for the Mir program, Mir-space shuttle dockings and then-involvement in the International Space Station. "Space facilities were partially destroyed, cooperative links broken, many skilled personnel in space science and technology lost," Marov reported. Despite these observations, Marov said that the Russian robotic space program still has life in it. "The situation right now is much more optimistic," he said. Indeed, Russia has an enviable record of exploration on Venus, the moon and Halley's Comet, explained Marcia Smith, editor of the SpacePolicyOnline.com website. "Despite setbacks, Russia today has an ambitious planetary exploration plan that may well be achievable technically," Smith said, "but is subject to funding constraints that may lead to schedule delays and increased interest in international cooperation." 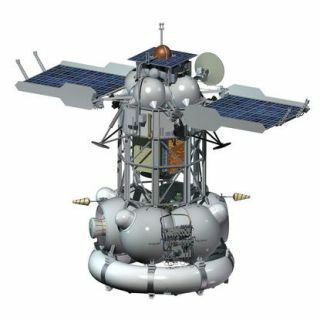 Russia's Luna-Resource mission is on the books as part of that country's reconnection with moon exploration. Asif Siddiqi, an associate professor in the history department of Fordham University in New York, shared that view. He is a scholarly specialist in Soviet Union and Russian space endeavors. "The Russians have never lacked in terms of ambitious plans, but the record of accomplishments in the past 20 years has obviously been poor," Siddiqi told SPACE.com. "I don't see any fundamental shift that's happened to change the paradigm. Although there are some small signs, such as cooperation with both the European Space Agency and India, that suggest that they are exploring other options. "The Phobos-Grunt disaster was a huge letdown," Siddiqi said, "because they prepared that mission over a long period of time." Overall, he views the Russian space industry as being beset by several issues: quality control problems, some degree of corruption and brain drain, as well as financing problems — money is tight. "Put all this together, and it creates a very risky situation," Siddiqi said. One Russian development to watch, Siddiqi explained, is the Skolkovo high-tech project, a plan to mimic Silicon Valley in terms of innovative research and production that may well find a home within Russian space development circles. Siddiqi also senses that there's a wait-and-see attitude about whether or not the next set of robotic lunar missions will work. "My guess is that if they are successful, you are going to start seeing more missions in the 2020s … but, of course, that also depends on their economy," Siddiqi said. "I would guess we'll see what happens in the next five years … and that will tell us a lot."